One of the most bizarre things seen in the solar system is captured in the image above, taken on 27 November by NASA's Cassini spacecraft. Cassini's camera zoomed into Saturn's polar hexagon storm's eye from from a distance of about 250,000 miles (400,000 kilometers). The spacecraft observed in infrared wavelengths, which can peer through the top layer of clouds to reveal the complex texture beneath. 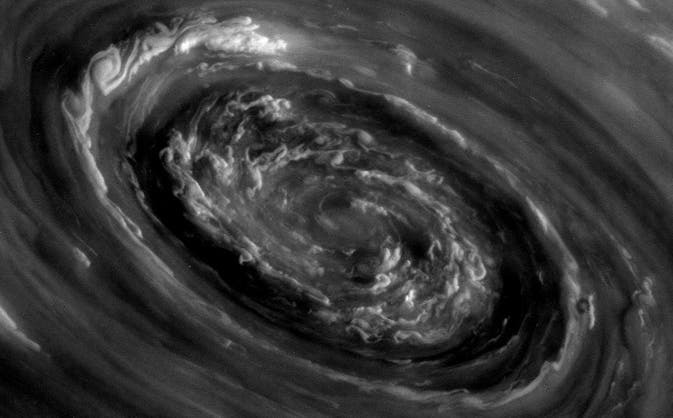 NASA's Cassini spacecraft has been traveling the Saturnian system in a set of inclined, or tilted, orbits that give mission scientists a vertigo-inducing view of Saturn's polar regions, yielding spectacular images of roiling storm clouds and the swirling vortex at the center of Saturn's famed north polar hexagon. These phenomena mimic what Cassini found at Saturn's south pole a number of years ago. In 2007, the Cassini team saw a huge hexagon-shaped structure two-thirds as wide as Earth about 25,000 kilometers across stretching over Saturn's north pole while planet was in the depths of its 15-year-long winter, and it was impossible to what was going on within the storm. But, with the change of the Saturnian seasons, the sun started to creep over the planet's north pole and spring lifted the gloom in 2009, and the team was able to view and study the massive storm at the hexagon's core. NASA scientists first spotted the hexagonal weather pattern when they stitched together Voyager images of Saturn's north pole. Cassini later obtained higher-resolution pictures of the hexagon – which tells scientists it's a remarkably stable wave in one of the jet streams that remains 30 years later – but scientists are still not sure what forces maintain the object. The hexagon was originally discovered in images taken by the Voyager spacecraft in the early 1980s. It encircled Saturn at about 77 degrees north latitude and was estimated to have a diameter wider than two Earths. The jet stream is believed to whip along the hexagon at around 100 meters per second (220 miles per hour). 'Now that we can see undulations and circular features instead of blobs in the hexagon, we can start trying to solve some of the unanswered questions about one of the most bizarre things we've ever seen in the solar system," said Kevin Baines, Atmospheric scientist at NASA's Jet Propulsion Laboratory after viewing Cassini images in 2009. "Solving these unanswered questions about the hexagon will help us answer basic questions about weather that we're still asking about our own planet." Because Saturn does not have land masses or oceans on its surface to complicate weather the way Earth does, its conditions give scientists a more elementary model to study the physics of circulation patterns and atmosphere, said Baines. The images of the hexagon, whose shape is the path of a jet stream flowing around the north pole, reveal concentric circles, curlicues, walls and streamers not seen in previous images. The last visible-light images of the entire hexagon were captured by NASA's Voyager spacecraft nearly 32 years ago, the last time spring began on Saturn. After the sunlight faded, darkness shrouded the north pole for 15 years. Much to the delight and bafflement of Cassini scientists, the location and shape of the hexagon in the latest images matched up with what they saw in the Voyager pictures. 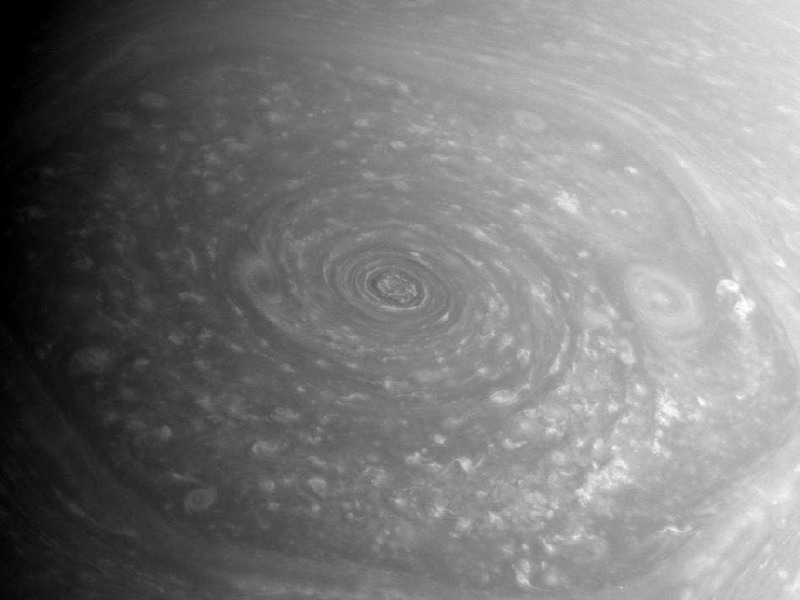 "The longevity of the hexagon makes this something special, given that weather on Earth lasts on the order of weeks," said Kunio Sayanagi, a Cassini imaging team associate at the California Institute of Technology. "It's a mystery on par with the strange weather conditions that give rise to the long-lived Great Red Spot of Jupiter." Early hexagon images from Voyager and ground-based telescopes suffered from poor viewing perspectives. Cassini, which has been orbiting Saturn since 2004, has a better angle for viewing the north pole. But the long darkness of Saturnian winter hid the hexagon from Cassini's visible-light cameras for years. Infrared instruments, however, were able to obtain images shown above and below by using heat patterns. Those images showed the hexagon is nearly stationary and extends deep into the atmosphere. They also discovered a hotspot and cyclone in the same region. Scientists are still trying to figure out what causes the hexagon, where it gets and expels its energy and how it has stayed viable for so long. They plan to search the new images for clues, taking an especially close look at the newly identified waves that radiate from the corners of the hexagon — where the jet takes its hardest turns — and the multi-walled structure that extends to the top of Saturn's cloud layer in each of the hexagon's six sides. Scientists are also particularly intrigued by a large dark spot that appeared in a different position in a previous infrared image from Cassini. In the latest images, the spot appears in the 2 o'clock position.